Flybe has announced that it will close its bases at Cardiff and Doncaster Sheffield at the end of the Summer season in late October. Flights using jet aircraft from Exeter and Norwich will also cease with only turboprop routes remaining. Services from Norwich operated by Eastern Airways under its Flybe franchise are not impacted. Some turboprop services at Cardiff and Doncaster Sheffield will continue but only where they can be served from a remaining base. These four airports are seen as underperforming and not part of the plan by the new owners, Connect Airways, to primarily feed passengers to major hub airports. British Airways and American Airlines have jointly announced some changes to their US scheduling for the Winter timetable, starting in late October. From 27th October, American Airlines is adding an extra Heathrow to Miami flight. There will now be five Miami flights each day, equally spaced, of which British Airways will operate three and American Airlines two. All of these flights are bookable with Avios, although only the British Airways services allow the use of a British Airways American Express 2-4-1 voucher and have off-peak discounted pricing. British Airways is adding three weekly flights to Philadelphia, which is a key American Airlines hub. The additional services will operate on Wednesday, Friday and Sunday, which will mean three flights per day. BA will operate two and American will operate one. There should be decent Avios availability on these new flights as they have just been announced. Terminal 5 gets a real dinosaur! 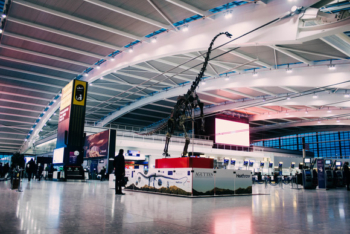 I had to check that it wasn’t 1st April, but Heathrow Airport is installing a real dinosaur skeleton in Terminal 5 from later this week. 13 metres high, the skeleton is 155 million years old. It is on display before being auctioned in France, where it is expected to fetch £2m. It is from a newly discovered species and is a cousin of the diplodocus. It is, apparently, the only known complete diplodocus fossil which has imprints of the skin on the bones. Just got an offer via email there for a 50% bonus when purchasing Radisson points. By my reckoning it works out roughly 0.35p per point, no matter how many you buy, which I think is somewhere close to Robs valuation? Anyway, you can buy up to 80,000 and deal ends April 30th. May be handy if you have a stay coming up and are short on points. Do you know when the Dinosaur is there until? My Daughter will love to see it but we aren’t flying with her for a couple of months. Thanks – she won’t be happy – She doesn’t go through T5 until End of June. O/t anyone want to give me a revolut code? It might not work as I downloaded app first, then deleted the app, then used the link. I’m not actually sure there are benefits (for either party) for using a referral link. I don’t have a Revolut code (can’t find on the app). But I have a better referral code for you guys: Bulb, UK’s first 100% renewable energy provider. Very competitively priced and great CS. If you use my link, BOTH you and me will get £50 EACH. It’s better than cashback sites. Here is the link, check it out soon! Blue status doesn’t really matter (though I guess Gold, GGLs etc get better service in these matters!) – you get more compo for Business/ First than for Economy, which makes sense given the relative cost of tickets. 80K sounds very fair verging on generous, how broken was broken? Wow, great result! Way more generous than I’ve had from them even when I was Gold. Also had more compo from Swiss for a damaged piece of checked luggage than I did from BA, despite the Swiss flight being short haul economy and the BA one F from Oz! That’s bizarre – and worryingly low Avios valuation. Do they know something we don’t?! Had a scaled up version of that amount but with the same cash v Avios ratio at the end of last year. While delighted with the compensation it certainly had me worrying about a devaluation. I already have a Amex plat card & now I’ve just received a supplementary card on my wife’s account. Can I add this new supplementary card into my main Amex login, or will I have to set up a new one under a new email address just for the supplemetary card? Can add to yours – my wife has supps and main cards together.